Now that we are at last allowed to know a little more about the TPPA negotiated in our name, it is clear that the free trade goal that was said to be the main point of the exercise has not been achieved. Tariff-free access for our dairy produce into US, Canadian and Japanese markets has been denied to us. Such small gains as have been secured are so insignificant that Tim Groser, the Trade Minister, could not even remember what they were. The best he could come up with was a small reduction over time in the Japanese tariff on cheese. The truth is that this much-touted goal was never even on the agenda. We were deluding ourselves – or our government was deluding us. The dairy industries of these large countries were too powerful and too protectionist to allow it to happen. New Zealand was just too small, too insignificant, to be taken into account. The negotiators knew, because we had made it clear, that we would take what we were given, even if it was virtually nothing – so much for “tough negotiation”. Even in those instances, such as kiwifruit and beef, where small gains were made, we – typically enough – put them in the shop window as net pluses, without taking account of the increased penetration of our own market across a wide range of other products. There is of course a powerful case for an international agreement that would regulate the activities of international corporate investors across national boundaries. Such an agreement would ensure that overseas companies would – inter alia – comply with national law, would protect the interests of their workforces and would avoid damage to the environment. But the TPPA is not such an agreement. Instead of defining the obligations of large foreign corporations in relation to the domestic economy, it tips the balance the other way. The TPPA is a blueprint for extending the operation of those corporations without their having to bother with the restrictions that might be placed on them by national governments in the interests of their domestic populations. Much soothing language is at present being used to try to reassure people that there is nothing to fear on this score. Our own lunch-time TV news even reported – parroting the official line – that this power had never been used. That assertion had been dropped by the time we had got to the evening news. The reality is that there have been hundreds of occasions where a power of this kind has been used – and that is to say nothing of those many more occasions where governments have been deterred from proceeding with their plans for fear of being hauled before a tribunal. What the apologists fail to take into account is that we are now dealing with notoriously litigious American corporations who have demonstrated many times over their willingness to use or threaten this undemocratic weapon. There is already the possibility that a mechanism will be set up in the US under which governments will be invited to obtain approval in advance from those corporations so as to avoid the danger that they will be forestalled later on – so that, in effect, overseas business interests will increasingly exercise a power of veto over what our government, and other national governments, want to do. As we assess the impact on democracy and self-government of conceding these powers under a TPPA, we are entitled to judge the democratic credentials of those who have pushed the TPPA by what we have seen of it so far. How can we have confidence in an arrangement that has been agreed in secret and over our heads, that has at the same time taken such care to consult and serve the interests of such a small group of powerful international business leaders, and that potentially has such a far-reaching impact on our ability to govern ourselves? No wonder the government has been trying to distract our attention with a stupid flag referendum. This is by far the clearest analysis of the TPPA that I have come across and you are to be thanked for helping us all to understand its implications. It is shameful that the government has sold the country down the river in this way. I cannot imagine David Lange acting in this craven manner! I understand that much the same applies on the other side of the Tasman. Read Mathew Hooten’s comments in this series of replies. You can almost see him salivating in desire for his new TTPA stick to beat the protesting public with when disputes about how to fairly make the rules to allocate the costs and benefits between labour and capital arise. I fear if Labour parliamentarians go with the Tory’s then the split between the politicians and the base will be terminal. The TPPA introduces a foreign body into our sovereignty that will forever change governance in NZ. Not only will foreign corporations have a power over our government like never before. But domestic vested interests aligned with foreign capital will have a new tool to stop unwanted progressive movements trying to solve important social problems -the the housing crisis, obesity, global warming and so on. The likes of Mathew Hooten are already lining up the argument that NZ hasn’t lost its sovereignty but the choice is either agreeing with the pro- corporation Investor/State Dispute Resolution Provisions or leave the TPPA. How often in the future will the likes of Mathew be encouraging foreign companies to threaten to take a progressive NZ government to this unaccountable court so they can then tell the public you can have trade or you can have progressive social policies but you cannot have both? To me this is the true cost of the TPPA. I wouldn’t sign it. I hope that the public gets a real debate on this. That Labour doesn’t automatically fall in behind the Tories. Really a decision like this needs the mandate of a referendum or general election. 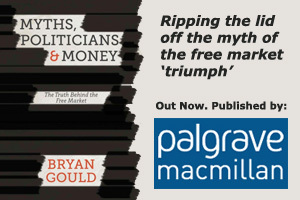 On a technical note Bryan you and Joseph Stiglitz are using a Ordo-Liberal argument -that the economy is made of rules and the make-up of those rules determines factors such as efficiency, equality etc. This seems to be step away from promoting your usual Keynesian or Neo-Keynesian policies (which I am not so convinced by).